On 3 November 2017 UNESCO participated in a panel discussion on Financing for Development on Water in Central Asia. 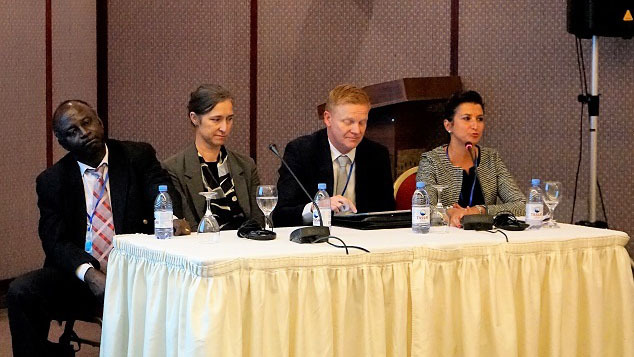 The discussion took place during the International Scientific and Practical Conference on Water Resources in Central Asia, organized by the International Science and Technology Center in cooperation with UNESCO Chair at the German-Kazakh University in Almaty, Kazakhstan. The Conference aimed to bring together representatives of scientific and research institutions from Central Asia, Armenia and Georgia, international experts, decision makers and private sector to discuss a wide spectrum of issues, including monitoring and assessment of water and land resources, transboundary groundwater, water and agriculture, water and energy. The panel of development partners, composed the World Bank, Asian Development Bank, European Union, German Society for International Cooperation (GIZ), OSCE and UNESCO representatives, discussed the funding opportunities and gaps, priority focus areas and other issues to be addressed for enhancing financing for development in the area of water resources management. UNESCO focused its intervention on the critical issues of higher education system and lack of qualified young researchers in the area of water, emphasizing the gap that exists between education, science and research, and further communication of the research to the users, beneficiaries and decision makers. UNESCO in its mandate offered to facilitate a step by step policy dialogue among the policy makers, universities, research institutions, industry and private sector to strengthen cooperation on water education and research in Central Asia, thus contributing to capacity development in water sector in a sustainable way. In its capacities as a member of an international advisory board of the Women and Water network in Central Asia, UNESCO discussed with the members of the network its forthcoming activities and the way forward.